Despite England’s obsession with the mythic King Arthur, the original legends surrounding that mysterious figure come from France. The newly uncovered fragments refer to the preparations for a battle near Trebes, by the South Riviera, where the king’s wizard Merlin and various legendary knights faced off against the forces of King Claudas. They contain details and variations different from all known versions of the Vulgate Continuation of Merlin (Suite Vulgate de Merlin,) from the larger Story of Merlin (Estoire de Merlin,) and predate any known English language telling of these tales. In addition, one of the most exciting elements of this particular find is that the Bristol fragments contain evidence of subtle, but significant, differences from the traditional narrative of the stories. 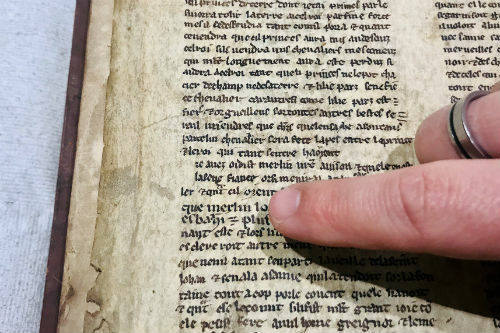 The seven hand-written parchment fragments were discovered by Michael Richardson from the University of Bristol’s Special Collections Library who was looking for materials for students studying the history of the book for the new MA in Medieval Studies. They were found bound inside a four-volume edition of the works of the French scholar and reformer Jean Gerson (1363-1429) and, recognising a number of familiar Arthurian names, Michael contacted Dr Leah Tether, President of the International Arthurian Society (British Branch), from Bristol’s Department of English to see if the finds were in any way significant.